Sometimes while feeding the dry bulk material to other equipment for further processing or conveying, the material may not move due to the less friction with the surface of the feeder and among the particles. 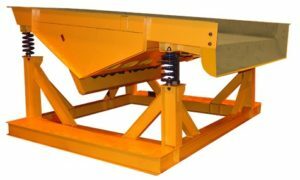 A vibratory feeder in such cases is required to make the material move forward over an incline by producing a vibration effect. Here the material itself is the most important factor. To be fed / conveyed properly it should have a high friction factor on steel (of which the feeder is manufactured) as well as a high internal friction factor so that conveying action is transmitted through its entire depth. Vibratory Feeders are essentially directional-throw units which consist of a spring-supported horizontal pan vibrated by a direct connected eccentric arm, rotating eccentric weights, an electromagnet or a pneumatic or hydraulic cylinder. The motion imparted to the material particles may vary, but its purpose is to throw the material upward and forward so that it will travel along the conveyor path in a series of short hops. Vibratory Feeders can be equipped to screen the fines ahead of the crusher, and can have easily adjusted feed rate.